Magician Amazing Jeffo, The Blind Magician! Accidents, aging or life’s daily setbacks, we all have them or will face them. The purpose and hope of this book is to encourage you to discover that there actually is joy in the struggle and a silver lining in the storm. On the Heels of his first book, Seeing Light in the Darkness, Jeffrey Smith now presents, Splashes of Laughter in the Storm. Those who were moved and inspired by his autobiography will laugh their socks off as they gain insight to what carries him and his wife through life’s rocky currents. 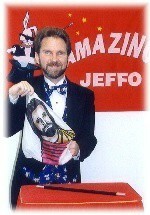 Jeff is a comic entertainer and Motivational speaker who has presented throughout the U.S. He has lived with life-long Rheumatoid Arthritis and blindness. His indispensable wife, Devon Smith, has a 25 year background working with youth and adults. She currently is living with a traumatic brain injury. Loaded with a quiver full of zingers and wise cracks, they forge ahead, fortified with humor and trust. 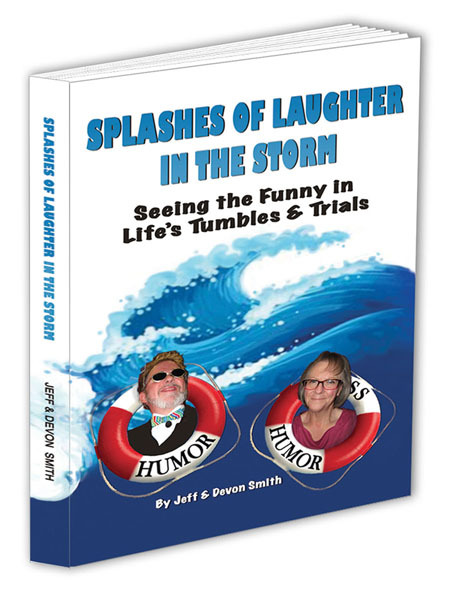 Sit back and enjoy a couple’s view of seeing the funny in life - a collection of disabling humor and out-of-sight observations. Joni Erickson Tada, Founder, CEO of Joni and Friends Radio Host, Speaker & Best Selling Author. Norm Barnhart - Comedian and Motivational Speaker. Magic shows, featuring the extraordinary magician, Amazing Jeffo, captures the imagination of all ages. 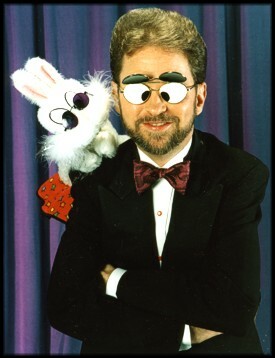 His engaging blend of magic, music and comedy entertains, educates and inspires. Through his performances Amazing Jeffo helps his audience become aware that everyone has a place in the world, and that our talents, abilities and unique perspectives can be offered to others. "Thank you for giving us such a magnificent show! It was wonderful! The kids had absolutely just great things to say about you. As you know one boy asked you to come back and he was speaking for all of the kids. We couldn't have made a better selection for our presentation. Thanks! Thanks! Thanks!" "A man who lives up to his title ~ Amazing!" "I'd like to say a huge ‘THANKS!’ Your performances were just outstanding! Thank you too for reminding us of our own talents and abilities through your talented example." 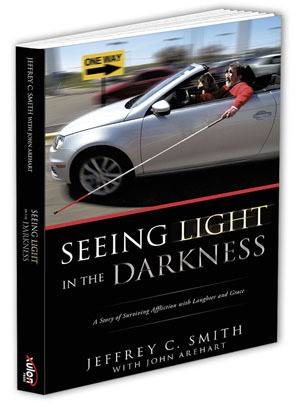 Jeff Smith is the first person to point out that sighted people are rarely comfortable initially with a blind individual. That's where his humor enters in, alternatively referred to as silly, cheeky, and sometimes corny. His humor is a vehicle which enables Jeffo to transition from one magical routine to the next, keeping the audience on their toes. Groups are delighted with his ability to ad-lib and involve them. "Don’t tell me I’m also color blind!" 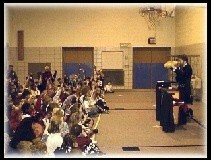 Smith tells an audience during a magic trick. When eager young attendees raise their hands to volunteer, he tells them, "You’ll have to raise your hands a lot higher than that for me to see them." And he instructs a volunteer, Pick a card and don't let me see it!" Most importantly, the humor serves as a vehicle that accents Smith's underlying message of "rising above challenges." This message can be also delivered in a Motivational Speaker format to all groups. "To see your independence from set up to take down was amazing. Your enthusiasm and respect for all ages is wonderful. I loved your humor for children as well as adults! Had continual entertainment even as volunteers transitioned to the stage." Amazing Jeffo confounds and amuses audiences with his special brand of illusion: selected playing cards rise from a jumbo deck, an image of Jesus suddenly appears on a poster, Jeffo reveals a word a volunteer silently chooses from a novel, a sword is visibly passed through the neck of a volunteer, Jeffo’s head shrinks half its size then enlarges twice its normal size. Magic classes and harmonica classes are available for groups or individuals. Amazing Jeffo shares his personal passion and awareness of the power of attitude in overcoming challenges. A button he wears on his tuxedo lapel illustrates this. It reads, "DISABILITY," however, there is a slash through the first syllable. Amazing Jeffo's message and example is a positive reminder of the heights we can reach when not limited by a negative attitude. He believes, "The most disabling thing in our lives is the thing we can do the most about - our attitude!" What amazes me the most is how God has matched what natural abilities and talents I have with the perfect job for me. I tried to find traditional employment for many years and in spite of having a 4 year degree in Journalism from the University of Minnesota I was unsuccessful landing a viable job. There’s something like a 70% unemployment rate among the blind. One employment opportunity that currently exists for the blind relates to working with computers, such as data entry or programming. Despite advances in adaptive technology that enable the blind to use the computer, computers and I have a love hate relationship. I’m so grateful that god took my natural gifts of humor, creativity and desire to teach, and turned it into this wonderful opportunity for me as Amazing Jeffo. In retrospect, I see how God has positioned me in a place where I can share the gifts He has given me with others. He’s always bringing caring people into my life that are encouraging and teaching me to explore new avenues that I hadn't had confidence enough to try on my own. Learning to laugh again amidst the daily grind; A mother and son retrospective. Jeffos messages and approach are adaptable to all groups within the church body, including adult, pre-school, school-age, middle and high school. Out of his hat, Amazing Jeffo pulls captivating magic and fresh surprises, sure to mesmerize your students! This blind magician inspires students to see their own abilities. As they laugh their socks off, they'll be learning about disabilities, gaining appreciation for reading, and building respect for themselves and others. Through magic, music and humor, Amazing Jeffo demonstrates to students how to maximize their talents for greater achievement. His highly visual magic compliments a message that encourages a positive attitude towards life, leading to good character development. 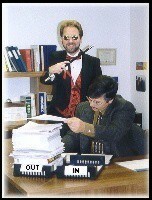 In addition to stage magic, I offer strolling magic for family nights, carnivals, fairs, open houses, and fund raisers. Shows are tailored to pre-school, elementary, junior and senior high school ages. Appropriate for all ages! Audiences are enlightened by not only what they hear but what they see as trick after trick illustrates how we can do all things through Christ who strengthens us. All ages are engaged as they see flawless feats of illusion and sleights-of-hand performed by an illusionist with crooked fingers, the result of severe Rheumatoid Arthritis. Moreover, audiences laugh their socks off listening to scores of jokes and funny ad libs from this special illusionist who began his magic career with a chronic speech condition in the form of stuttering, which miraculously disappeared after starting as the Amazing Jeffo. "I learned to rely more on God's strength alone," says Jeffo. Jeffo’s warmth and openness, combined with a lighter style and gentle approach with volunteers, disarms and helps reinforce biblical truths which he weaves throughout the performance. His skill on the harmonica adds color and depth to the show, playing popular worship songs and favorite hymns. Jeffo's inspiring message helps occasional attenders feel comfortable and more connected with the church. Jeffo’s corporate shows are motivational as well as entertaining. He has performed for audiences at St. Paul Saints games, the Minnesota Zoo, Deluxe Check Company, FDA, Army corp of Engineers, IRS, USDA, 3M, Metro Council, VA, and many others. Create a birthday memory to last a lifetime. Initially, the audience is wowed by the magic and laugh their socks off at the jokes but they also leave with a valuable life lesson: through Jeffo’s gentle and disarming approach they'll "accidentally" learn about the ability of people to overcome challenges in their lives. Their eyes will be opened to the concept of people's differences - all done in an entertaining style. Students will develop public speaking skills and self-confidence as well as learn some really cool magic tricks in "Discover the Secrets of Magic I & II".